Including book and certificate of participation. Duration is 6 to 8 hours. Additional cost will be room and meals. What is PADI Emergency First Response? You will complete a series of exercises that will lead you to perform primary and secondary care. You will learn the basic knowledge of First Aid and CPR. Normally 4 to 6 hours. Continue to Padi Rescue Diver course. Including book and license only. Course duration is 3 days. 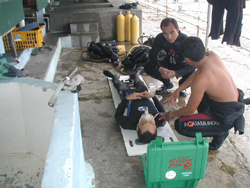 What is PADI Rescue Diver course? Rewarding and fun  that best describes the PADI Rescue Diver course. This course will expand your knowledge and experience level: Rescue Divers learn to look beyond themselves and consider the safety and well being of other divers. Although this course is serious, it is an enjoyable way to build your confidence. Be certified as a PADI advanced open water diver or have a certification from another organization. This is defined as proof of certification beyond entry level (at least two certifications total) Diver, must have proof of at least 20 or more logged dives documenting experience in deep diving and underwater navigation. Before certification you must have proof or CPR training within the past twenty-four months. The PADI EFR or PADI EFR/Care for Children course is recommended. Course Description: Serious Fun! Learn to look after yourself and others! PADIS Rescue Diver program will build your confidence as a diver, give you valuable experience in emergency management and prevention and heighten your awareness of the surrounding environment. Sections on self-rescue, diver stress, diving first aid, emergency management, equipment problems will prepare you to handle almost any emergency whether on the shoreline or in the water. The PADI Rescue Diver Course is widely accepted as one of the most challenging, rewarding and fun dive courses available! Continue to Padi Dive master course.